Last week, I found a book chapter online, whose broad topic I'd like to share with you today. It discusses Rune carvers of today. Actually, let me clarify that and say runestone carvers of today. The article does two main things; it interviews two present-day runestone carvers and defines three types of modern runestones. It is the latter which I found most interesting and want to focus on here, because I see clear links to how we perceive the magic of Runes. The three types of contemporary runestone carvings highlighted in the article are those that are "exact copies of existing stones", "explicitly contemporary", and "new, but with Old Norse". Exact copies of old stones is self-explanatory and they can serve as a tool for people who study the past. The replica of the Gimsøy runestone, in Norway, is an example of this. Stones like this, that are copies of Viking Age stones, can be displayed only with the permission of the authorities. Runestones that are explicitly contemporary relates purely to when they were carved and the language used. In this category, while the writing is in Runes, the language is Swedish or Norwegian, for example. In other words, the modern language is simply written in Runes. This makes determining the status of the stone (Viking Age or contemporary) easy. The picture above is an explicitly modern runestone that was carved at the Lofotr Viking Museum at Borg in Lofoten, Norway. The museum representative told me that she was unsure what was carved on it, but it was likely a modern phrase. Finally, there are new Runes written in Old Norse, the language of Viking Age Scandinavia. 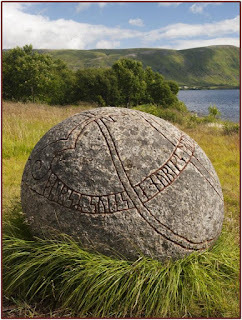 It is important to be able to discern these stones from Viking Age runestones. In fact, one of the runestone carvers, interviewed in the article, has documented all of the stones he's carved with the National Museum in Copenhagen, because he uses Old Norse on all his stones. Now, how do these categories apply to the way we use Runes as an oracle today, the magic? For starters, we don't have to worry about "exact copies of existing stones". One of the conundrums of reading runes is that we really do not know how Runes were used historically, so we cannot copy, exactly, the process or magic. In fact, as I have mentioned before, I am not aware of any set of Runes found at any Viking Age archeological site. However, because we lack the details of their original use, two camps have developed - the purely new age group and the group seeking to be as historically accurate as possible, based on the what we do know about Runes and their meanings. I do not deny that I began my pursuit of the Runes through a contemporary source, but one that, despite its new age origins, remained reasonably accurate, though sometimes broad, in its interpretation of individual Runes. As I learned more about the historical meanings of the Runes through the Runes poems, my position has shifted and I now fall within the second group of people, who try to be as historically accurate with our interpretations as our insight provides. What about you? Which category do you fall into? Do you think the categories work for Runes?